This topic provides instructions for installing the Quick Data add-in, configuring the Quick Data add-in in WebFOCUS, and configuring a default WebFOCUS environment in which to use Quick Data. 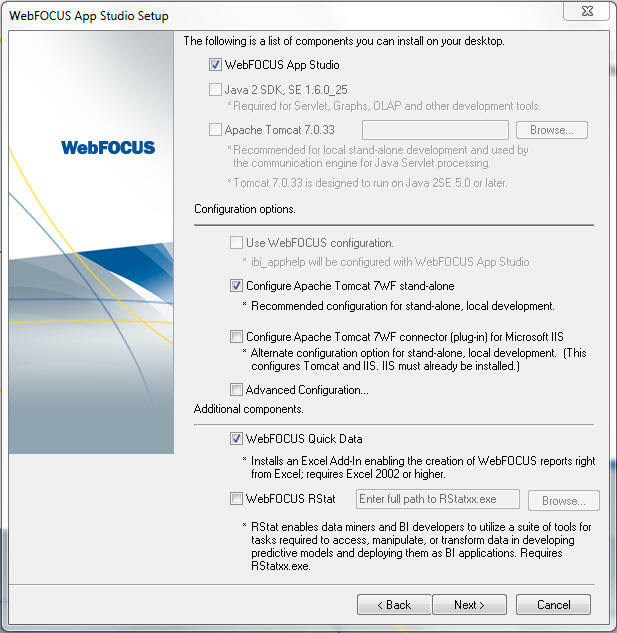 While installing a WebFOCUS desktop product, such as App Studio and Developer Studio. The full App Studio and Developer Studio editions include the Quick Data component, which can be installed and used with the App Studio or Developer Studio environment or with a WebFOCUS environment that is licensed for Quick Data. Manually distributing the Quick Data add-in file. If you have WebFOCUS with a licensed version of Quick Data, you can distribute the Quick Data add-in file to the machines that will use Quick Data. When using this installation method, you must also enable the Quick Data add-in from Excel. If the Administrator has provided a WebFOCUS environment in which you can work, as defined in a configuration file, you can begin using Quick Data, as described in Using the WebFOCUS Quick Data Add-in. If a WebFOCUS environment is not yet set up for you, you must manually define the WebFOCUS connection parameters, as described in Manually Defining Web Server Connection Settings. The following topics provide the installation procedures for both methods, and explain how to manually define the WebFOCUS connection parameters. 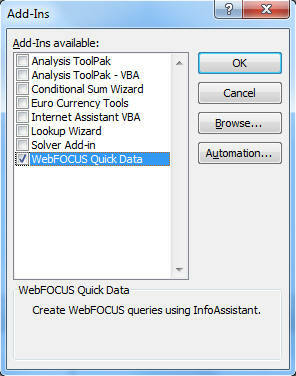 You can install the Quick Data add-in with a WebFOCUS desktop product, by selecting the WebFOCUS Quick Data check box in the WebFOCUS Developer Studio or App Studio Setup window, as shown in the following image. When you continue the WebFOCUS desktop product installation, your selection will automatically place the WebFOCUS Quick Data add-in in the proper location, where it can be detected and used by Excel. Enabling the WebFOCUS Quick Data option through a WebFOCUS desktop product provides a single-user license applicable only to this desktop product user. Quick Data interacts with the local desktop product environment or with a licensed WebFOCUS environment. You must separately license WebFOCUS Quick Data when it is used in multi-user WebFOCUS environments, and when a desktop product and WebFOCUS are installed on the same computer. Whenever you need to install the Quick Data add-in without simultaneously installing a WebFOCUS desktop product, such as App Studio or Developer Studio, you can distribute the files that run the Quick Data add-in directly to those computers that will use it. Add the two files to the following directory on the machines that use Quick Data. Is the name of the user logged on to the PC. After the WebFOCUS Quick Data add-in file is in the proper directory, you must open Excel and select the WebFOCUS Quick Data option in the Add-Ins dialog box, as described in the following procedure. Use the following steps to enable the Quick Data add-in in Excel 2013. Click the File tab, click Options, and then click Open. From the Excel Options dialog box, click Add-Ins. From the Manage list on the Manage Add-Ins page, click Excel Add-ins, and then click Go. The Add-Ins dialog box opens, with WebFOCUS Quick Data as an add-in option, as shown in the following image. If WebFOCUS Quick Data is not listed in the Add-Ins dialog box, ensure that the add-in file is installed and placed in the correct directory. If the Quick Data add-in was installed in a different directory, use the Browse button in the Add-Ins dialog box to locate it. Select the WebFOCUS Quick Data check box and click OK. The dialog box closes, and the Add-Ins tab appears on the ribbon. Click the Add-Ins tab to view the new WebFOCUS menu, as shown in the following image. Use the following steps to enable the Quick Data add-in in Excel 2010. In the Manage dialog box, click Excel Add-ins, and then click Go. If WebFOCUS Quick Data is not listed in the Add-Ins dialog box, make sure that the add-in is installed and placed in the correct directory. Select the WebFOCUS Quick Data check box, and then click OK.
Click the Add-Ins tab to view the new WebFOCUS menu. Use the following steps to enable the Quick Data add-in in Excel 2007. From the Manage drop-down list, click Add-ins, and then click Go. The Add-Ins dialog box opens, with WebFOCUS Quick Data listed as an add-in option, as shown in the following image. Select WebFOCUS Quick Data, and click OK.
By default, WebFOCUS Quick Data is configured to provide Reporting Server security, which enables you to create and edit reports using WebFOCUS InfoAssist. You can configure WebFOCUS Quick Data in the WebFOCUS Administration Console to enable MR Authorization, which provides secure access to data through the WebFOCUS environment. You can configure a setting in the WebFOCUS Administration Console to provide the ability to create queries by accessing Structured Ad Hoc Forms (SAFs) stored in Managed Reporting content. An SAF is an HTML form containing a report procedure that is already connected to a data source. It enables you to select from a series of parameters to build a data set for analysis in Excel. On the Menu bar, click Administration, and then click Administration Console. In the left pane, expand the Configuration section, expand Application Settings, and then click Quickdata. The Application Settings - Quickdata panel opens, as shown in the following image. Keep the value WFRS, displayed by default, to implement the Quick Data add-in with standard-level Reporting Server security. Under this setting, the Quick Data add-in presents users with a list of metadata determined by the server configuration and the access limitations in their user or server profiles. Delete the WFRS value and type MR to upgrade to Managed Reporting level security. Under this setting, the Quick Data add-in presents users with an authorized list of Master Files, and the metadata they contain, which is based on the application path set in the properties of a repository folder. Keep the default value of No to allow users unlimited access to InfoAssist for report creation. Select the value Yes to limit users to the use of structured ad hoc forms (SAFs) for all reports. Click Save to save your configuration settings. If Quick Data is configured to use WebFOCUS Reporting Server (WFRS) authentication and the Public anonymous user is enabled, you must configure permissions for the Anonymous user, to grant access to the list of Reporting Servers. Sign in to WebFOCUS as an administrator. In the Resource tree, right-click the Content node, point to View, and then click Full View. The Resource tree now shows the available WebFOCUS subsystems. Right-click the EDA folder, point to Security, and then click Rules. The Security Rules - EDA dialog box opens. Clear the Only show Groups with Rules check box. The Anonymous user group now becomes visible. In the bottom pane, click the ListAndRun rule. In the Access column, change Not Set to Permitted, as shown in the following image. In the Resource tree, right-click the WebFOCUS node, point to View, and then click Repository View. The Resource tree changes to the default state. A configuration file is provided with the Quick Data add-in for the Administrator to use as a template when designing a default WebFOCUS environment. The configuration file defines items such as the WebFOCUS web server port number, alias, and client path. Providing users with a default WebFOCUS environment allows them to bypass the additional step of manually defining these parameters in order to use Quick Data, as described in Manually Defining Web Server Connection Settings. The configuration file can contain multiple WebFOCUS configurations. Keep in mind that if the configuration file contains more than one WebFOCUS configuration, the last one appearing in the file is the configuration that is used when Quick Data is opened. The use of double quotation marks around a parameter value, as shown in the example, is optional. Begin a comment line in the file with a number sign (#). The configuration file must have the same name as the Quick Data add-in file, and must have the extension .cfg, such as wfquickdata.cfg. The configuration file must reside on the machine running the Quick Data add-in, in the same directory as the .xla file. Each WebFOCUS configuration must be begin with the delimiter, SERVER_START, and end with the delimiter, SERVER_END. PROTOCOL. The protocol used in the environment running WebFOCUS. If WebFOCUS is running in a Secure Sockets Layer (SSL) environment, you must specify https as the protocol value. The default value is http. HOST. The name of the server on which the WebFOCUS web application is installed. PORT. The port number of the application server on which WebFOCUS is installed. Note: The leading slash is required. Is the context root of the WebFOCUS web application. The leading slash is required. You can configure this value. Is the name of the WebFOCUS Servlet.